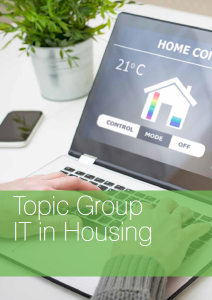 The IT in Housing – Digital Communications & Technology Topic Group aims at promoting business transformation using technology related developments in communications, computing, mobile devices, internet of things, channel shift (omni channel) and the use of Big Data. It is not always easy to keep up with developments, which means that it can be difficult for people who do not have the same requirements to cope with everyday life in the long term. The number of non-internet users continues its gradual downward trend and big improvements have been made in some countries with large rates of non-users. However 20% of the EU population has still never used the internet. The biggest barriers to internet access at home in the EU are lack of need, insufficient skills and cost barriers. For families with children and low income households costs are particularly important. 47% of the EU population has insufficient digital skills, 23% has none at all. 64% of disadvantaged people (aged 55-74, low educated, or unemployed, retired or inactive) have an insufficient level of digital skills, 38% have no digital skills. Develop and promote best practice in mobile / agile working environment for our employees.